I’m partial to this picture. If you’ve ever wanted to see an image of all things farm, this is it. Chevys. A dryer. A land yacht of a truck. Seed corn hats. Brothers. Tired smiles. It’s all here. I don’t think there’s anything better for two men that love the outdoors than big skies, dirty fingernails, and corn dust in the air. The year is 1985, and the man on the right is my dad, still managing to smile one year after I was born, despite my intense case of colic and generally bad attitude. 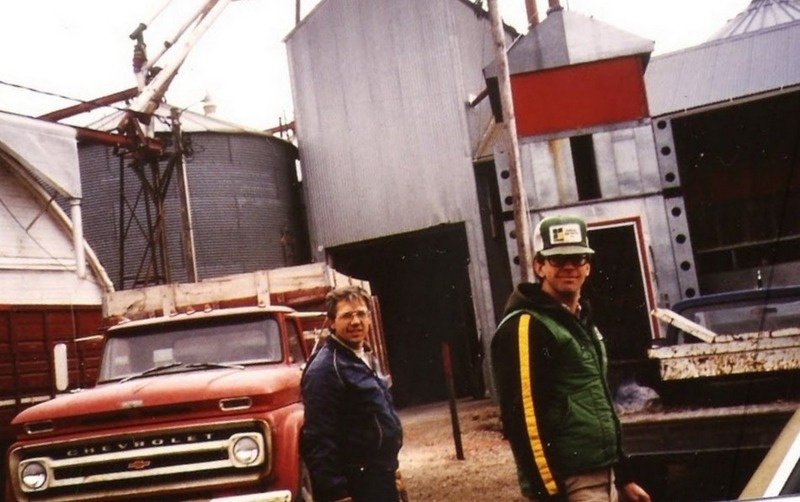 During the harvest season, Dad, his brother, and the hired hands would take turns sleeping in a little glassed-in room next to the dryer to make sure that nothing started on fire or stopped working or broke in two. It was a tiny little room, barely wide enough for them to unfold a cot inside. You know what it means to be clobberfostic, right? Oh, c’mon. We all suffer from it. It’s that feeling you get when there are too many people on an elevator. Or you’re touring a mine, and it suddenly gets very, very dark, and you feel like you can’t breathe. That’s being clobberfostic. Or claustrophobic. Whichever. Dad knew what I meant. And he found it endearing. He also continued to let me say clobberfostic for a good five years without correcting me. He thought it was cute. What he doesn’t know is that even now, today, when I’m having a conversation with someone, and I get to the word claustrophobic, I have to stop, think of the word, think of the other/correct word, and then speak. So there goes the endearing theory. But I don’t blame him. Look at this picture. He’s busy. He’s got a farm to run, and pigs to feed, and tractors to drive, and manure to haul, and hired hands to joke with. And in the midst of all of that, he had time to tickle his three daughters and pretend he was going to dump us out of the bucket of his Bobcat and pour water all over our tent, pitched in the front yard, while we screamed like a bunch of crazies, convinced he was a wild bear attacking us in the middle of the night. He’s a busy guy, my dad. Maybe that’s why I like this picture so much. It’s a little snapshot, just a moment in a big, full life, and I’m glad to have it. Even if it does make me clobberfostic. You missed one part of the description from the photo of your Dad. Like me, it was back in the day when we had hair! Dark hair, at that! By the way, which brother is it? Great photo and story — reminds me of home. You captured it. Love it!